Let’s all Strike the Ground! It is sometimes too easy to simply take a local view of what God wants to do, but through prayer, we are equally able to influence our Nation. The following is a Message just received today, 18th January, from Adele Richards, Senior Leader, Catch the Fire Bournemouth, who promoted a Day of Prayer on 9th December 2108. 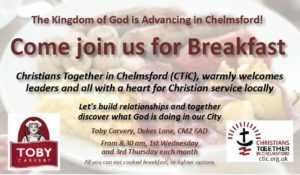 A number of Chelmsford Christians took part in this. How about this time too? Next Next post: Prayer for Our City – this Thursday – you need to be there!